I designed this sequence of pages to reflect some of the visual and historical motifs of the city of Venice. The Palatino font used for the logos and navigation images is a compliment to Aldus Manutius, the 15th-century Venetian inventor of Italic type and the mass-market book.  The lion used as the repeating background is the Lion of St. Mark, who appears in Venice in an almost infinite number of representations. Frequently, as here, he is shown with a book, intended to represent the Gospel of St. Mark. 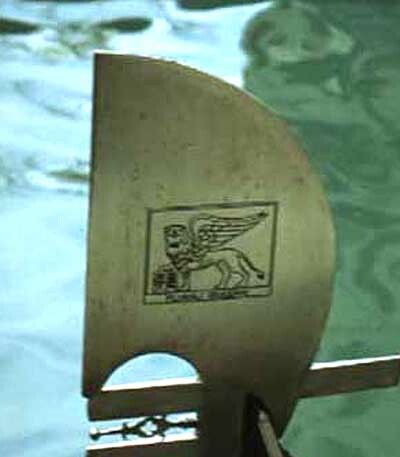 This particular lion was derived from the design engraved on the ferro, or metal bowpiece, of the gondola shown on the main page, expanded in the photo to the left of this text. The colors for the logos, navigation and background were chosen to reflect the watery environment of Venice, and to not clash with or overpower the photographs. Two photographs, of the canal on the "Explore Venice" page, and of the gondola on the "Venetian Maze" page, seen also in the detail on this page, were taken by Charles Spurgeon. All other photos were taken by me (Joann Zimmerman). All photographs and commentary are copyright. Please do not use this material for any purpose other than Web browsing without my express written permission.